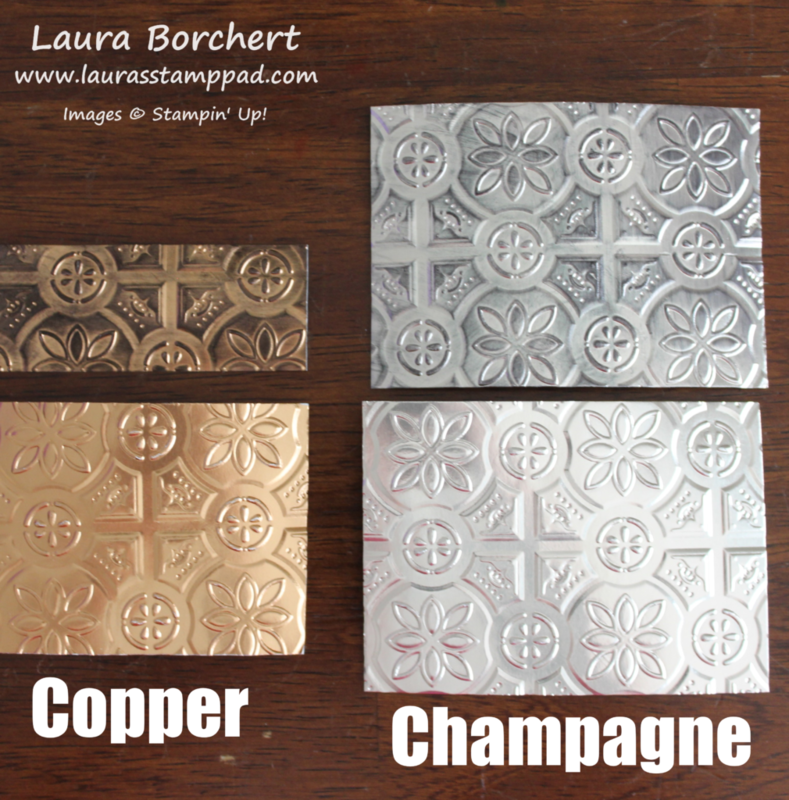 Technique Tuesday – Coloring Embossing Paste with Sponge Daubers!!! Happy Tuesday!!! You all know what that means!!! I have a fabulous technique to share with you today. 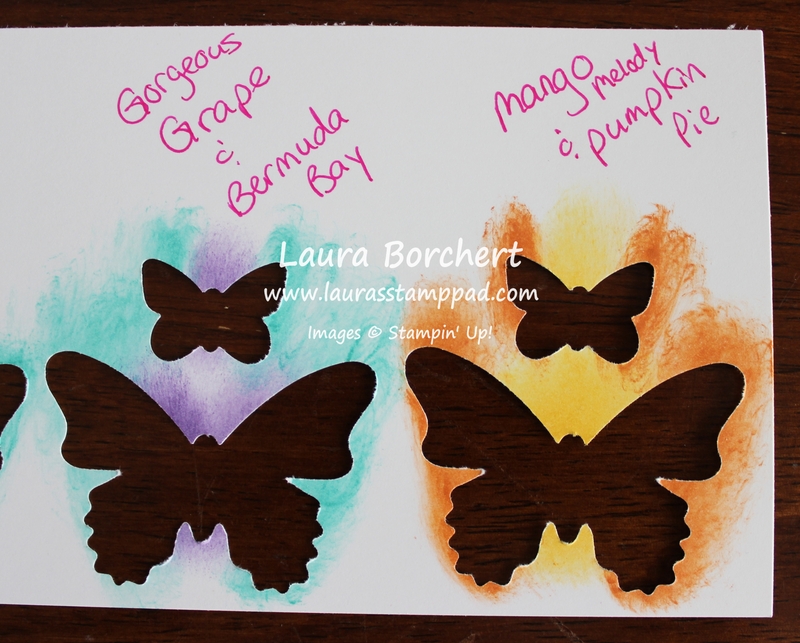 I’m coloring Embossing Paste with Sponge Daubers. 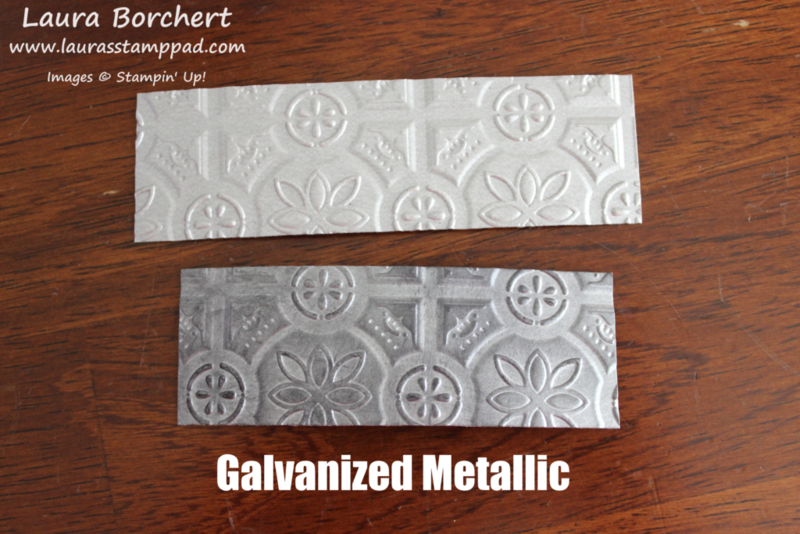 This technique is super cool because you only use the amount needed of the Embossing Paste. When I colored some with Re-Inker in the past, I ended up making millions of cards because I colored too much paste! 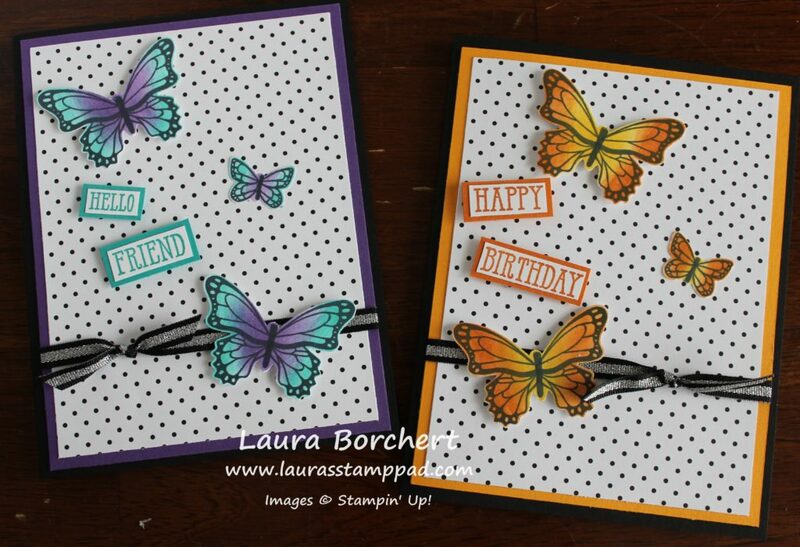 I love how that background adds texture to the card and gives it a fun variation in color. Also, I love love love my Sponge Daubers and while I have used them in awhile, I do enjoy it! 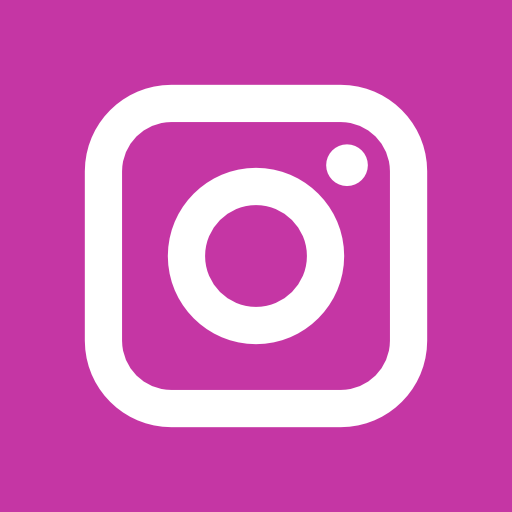 I started with a Whisper White card base measuring 4-1/4″ x 11″. 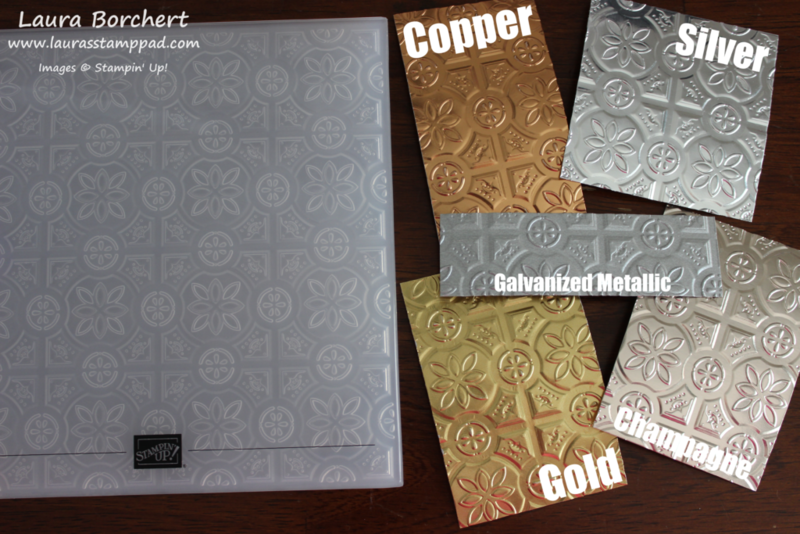 Next, I took a piece of Pear Pizzazz measuring 3-3/4″ x 5″ to add the Embossing Paste to it. First, I took the Sweet Soiree Decorative Mask and added color all over by pouncing a Sponge Dauber over the top. You can always use the same color (Pear Pizzazz) or go a shade darker like Old Olive or Wild Wasabi. Mixing the colors and pouncing all over would be fabulous too. After adding color in an area big enough for the cardstock, I placed the mask over the cardstock and onto the Silicone Craft Sheet. Then I added the Embossing Paste and as it swipes across the mask it picks up the color. I love it! Peel off the mask and allow it dry! 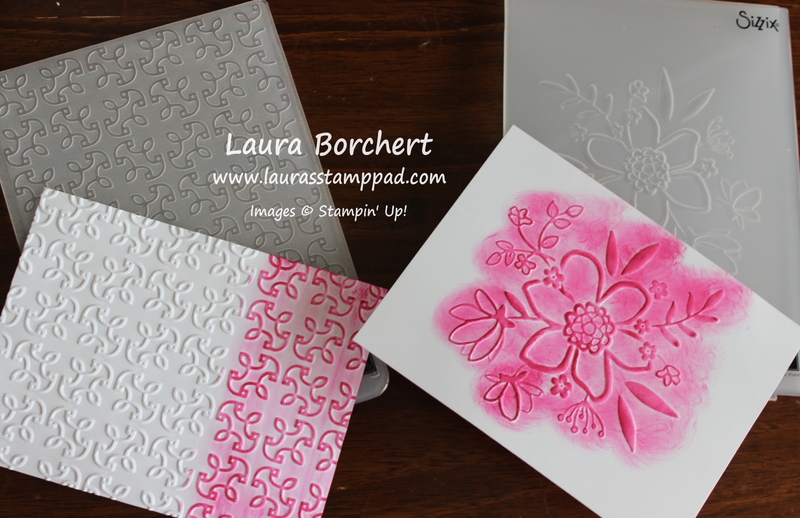 While the Embossing Paste is drying, I worked on the floral image and greeting. 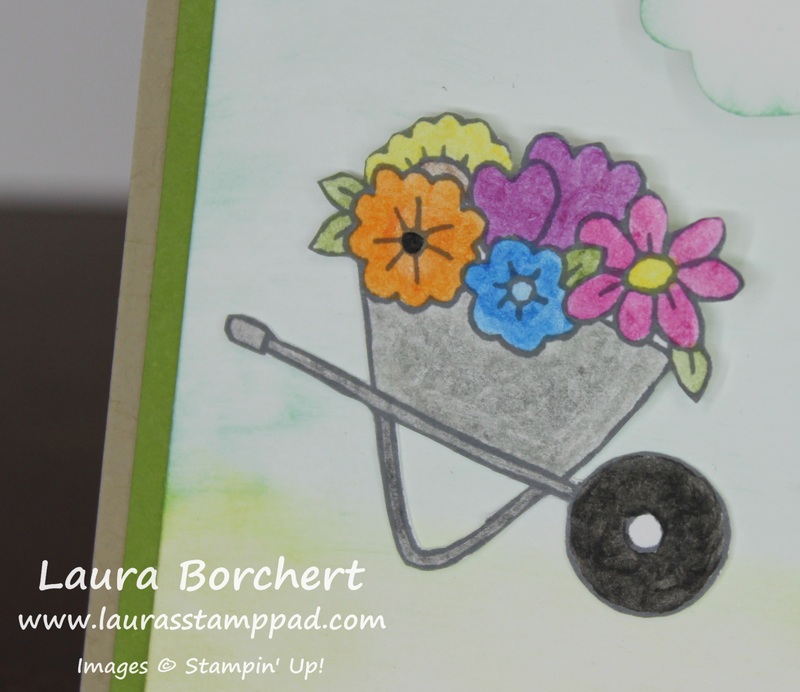 Using the Petal Palette Stamp Set and coordinating Petals & More Framelits (Bundle & Save 10%), I stamped the flowers and greeting Memento Black Ink. Then I colored the flowers with the Old Olive and Calypso Coral Stampin’ Blends. After coloring, I die cut the flowers out and the greeting with the frame. Now to assemble, I added some Organza Ribbon around the card and then added it to the card base. 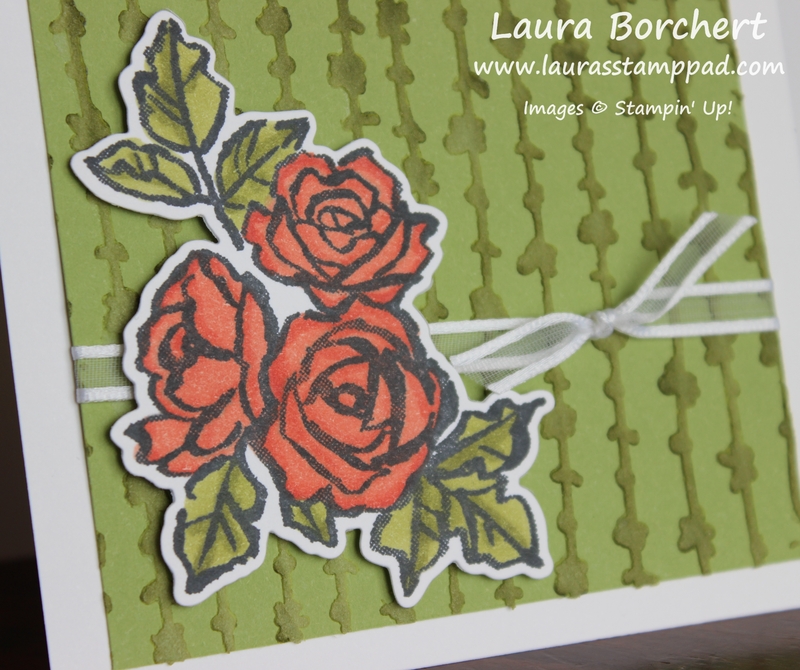 Next, I added the flowers and greeting to the card front with Stampin’ Dimensionals. This gives the card some texture but also a nice smooth look over the Embossing Paste. To finish off the card, I added some Enamel Shapes to the greeting. 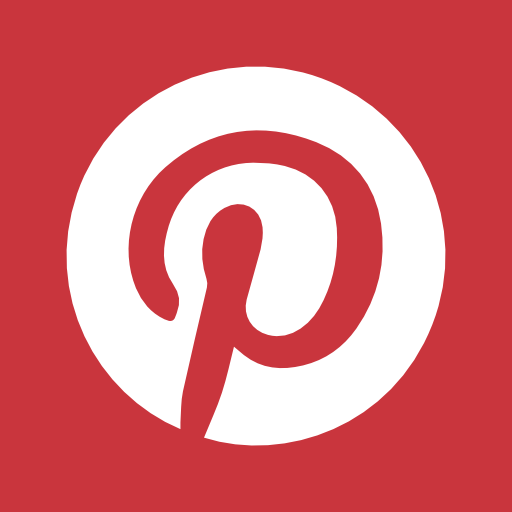 I love it and it’s perfect for lots of occasions! 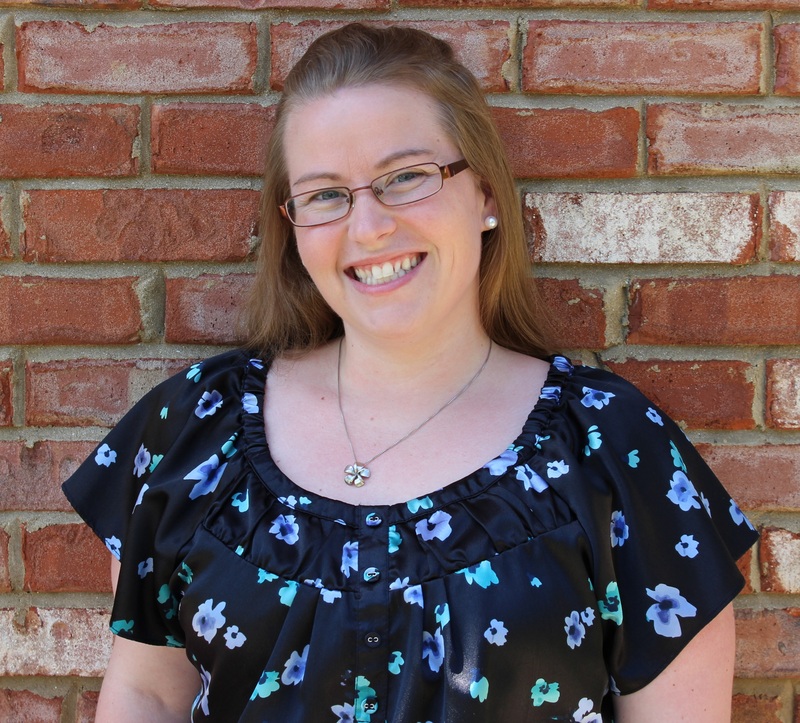 Technique Tuesday – Creating a Background Frame!!! Happy Tuesday!!! That means I have a fabulous technique to share with you today! I’m showing you how creating a background frame for your focal point is super easy and fun to do!!! You all know how much I love flowers……I just can’t help myself!!! 🙂 This technique can be used for any type of card though and not just flowers! Simply sponge on the frame and add your focal point! I started with a Soft Sky card base. Next, I took a piece of Whisper White measuring 3″ x 5-1/4″ for the focal point. Using the Lots of Labels Framelits, I die cut out one in some of the “cardboard” that comes with Designer Paper. That thicker piece with the paper pack details on it. This will hold up better for multiple uses and I’m not wasting cardstock! 🙂 I placed the reverse image (not the label) over the cardstock and added Soft Sky Ink with a Sponge Dauber! Just fill in to the desired color! Next, I filled in with the greeting and flowers! 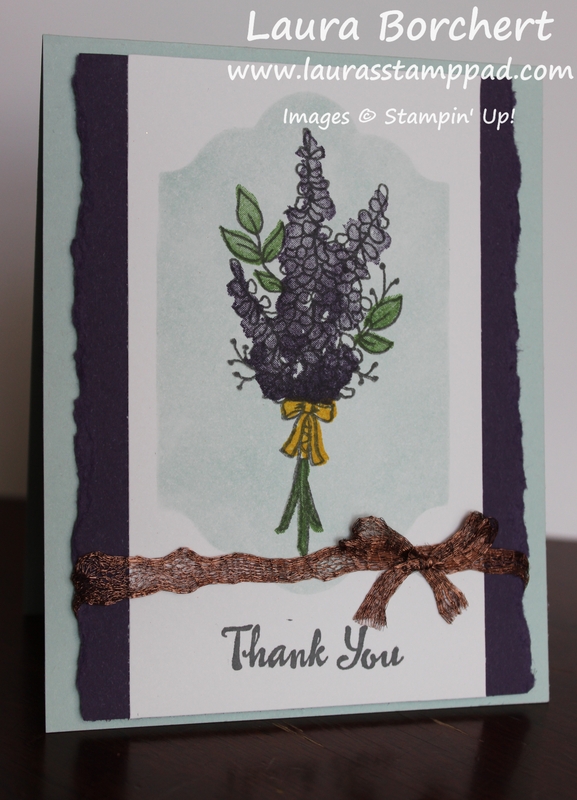 Using Basic Gray Ink, I stamped the greeting from the Petal Palette Stamp Set and the flowers from the Lots of Lavender Sale-A-Bration Stamp Set. Then I stamped the flowers in Elegant Eggplant Ink and stems in Garden Green Ink. The bow was stamped in Crushed Curry! Next, I layered this piece onto Elegant Eggplant which I tore both ends for some texture. Using the Copper Trim, I pulled it apart a bit and added a strip along the bottom. Then I took another piece and made a bow and attached it with some Mini Glue Dots! 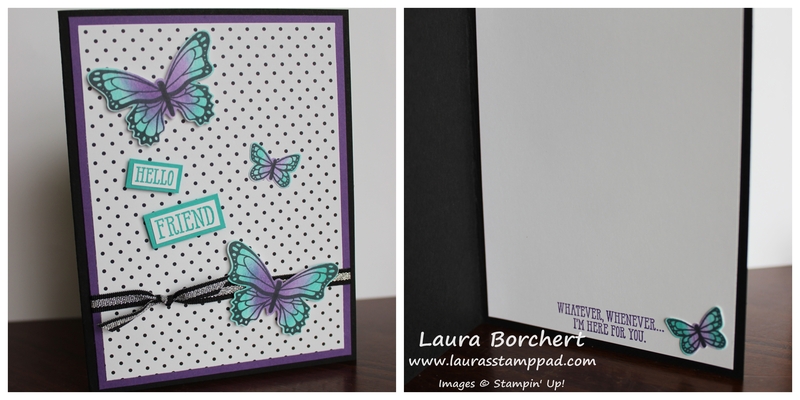 I added this focal point to the card base with Stampin’ Dimensionals! Don’t forget that Sale-A-Bration is almost over! It ends March 31st so be sure to stock up and get those items on your wish list now so you can take advantage of the freebies!! Happy Wednesday! Here’s a little coffee to help you through the rest of the week. I am not a coffee drinker but have fallen in love with the Coffee Cafe Bundle and this adorable little pun…..You Mocha Me Crazy!!! I started with a Pear Pizzazz card base. Next, I took a piece of Whisper White (4″ x 5-1/4″) to stamp on. Then I just placed a piece of the Coffee Break Designer Series Paper (1″ x 5-1/4″) at the time. I didn’t adhere it just yet….in case I messed up my stamping. 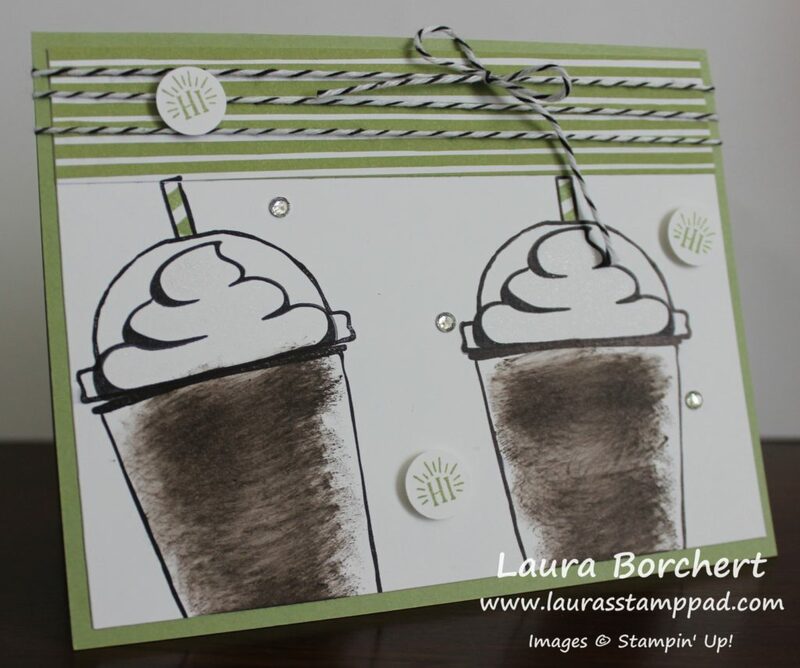 Using the designer paper as a guide, I stamped the lid and whipped topping from the Coffee Cafe Stamp Set in Basic Black Ink making sure to leave room for the straw. Then I stamped the cup and the straw. I did it this way so that my spacing worked and everything fit. If I had stamped the cup first and added all the extras on top, it might be too high for the designer paper. When stamping the straw, simply place a scrap piece of paper over the lid as a mask. The straw stripes were stamped in Pear Pizzazz. For the coffee part, I placed scrap paper on either side of the cup and added some Early Espresso Ink with a Sponge Dauber! Now to assemble, I officially adhered the designer paper and attached it to the card base. Next, I wrapped some Black Baker’s Twine around the card and tied it into a bow. 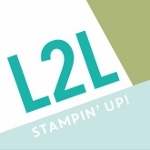 Using the little greeting from the Coffee Cafe Stamp Set, I stamped it on scrap white and punched it out with the 1/2″ Circle Punch. 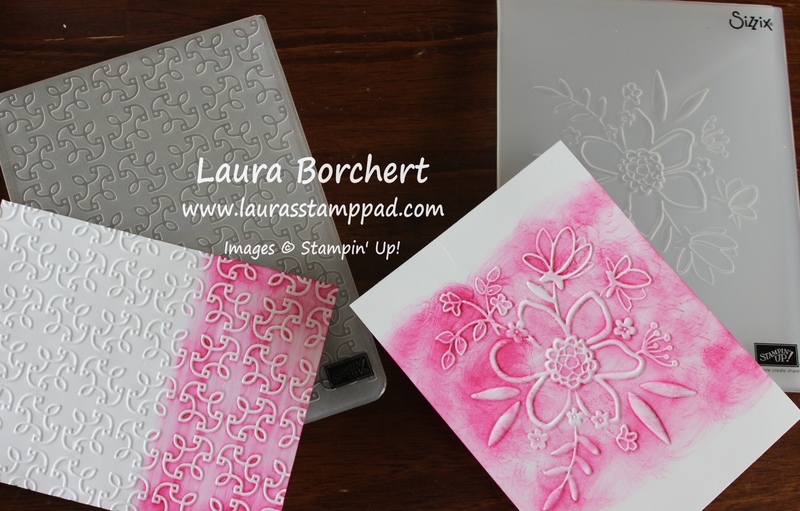 I added those with Mini Stampin’ Dimensionals and a few little Rhinestones for some bling! This Welcome Baby Card is simple and yet precious! Change up the colors for a specific gender or to match the child’s nursery colors! 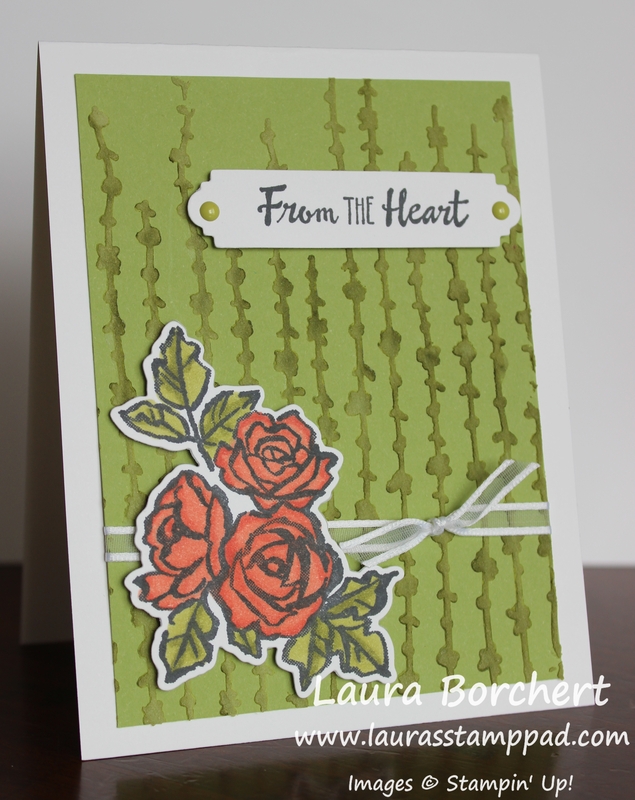 I just love to soft colors and the texture from the embossing, ribbon, and scallops! I started with a Daffodil Delight card base! Next, I took a piece of Whisper White measuring 5″ x 3-3/4″ and embossed it. I ran it through the Big Shot in the Oh My Stars Embossing Folder and added it to the card front. Using some of the Daffodil Delight Double Stitched Ribbon, I tied a knot around the card in the middle. For the greeting, I die cut out the smooth circle and scallop circle with the Layering Circles Framelits! 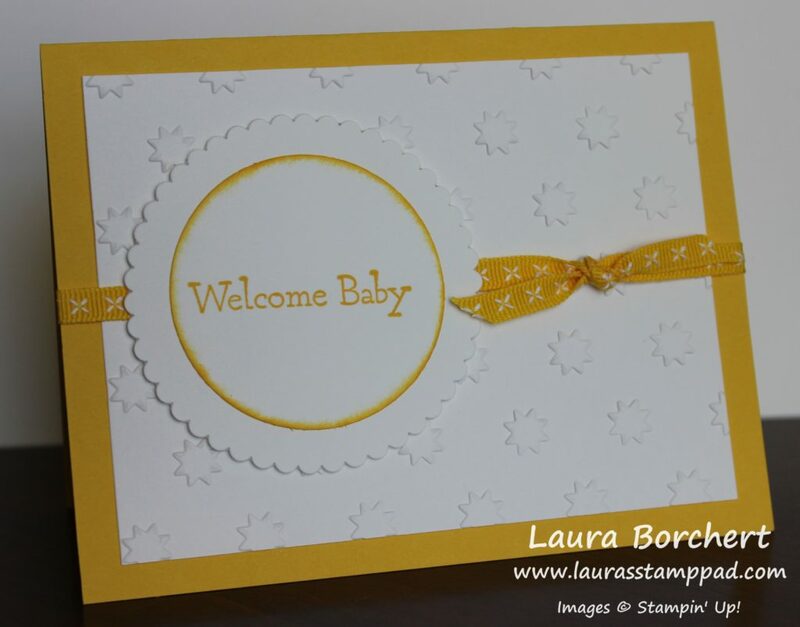 The greeting was stamped from the Special Celebrations Stamp Set in Daffodil Delight Ink. To add a little more color to the greeting, I brushed the edges of the circle with a Sponge Dauber! 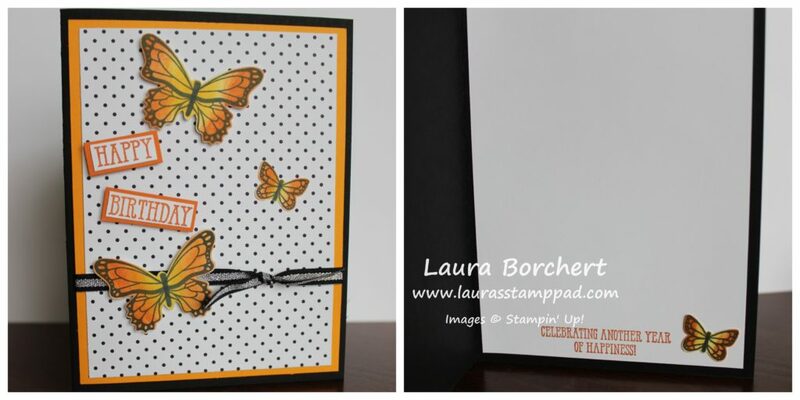 I layered the circles together and then added them to the card front with Stampin’ Dimensionals. I love the simple, clean look of this card. It is one that could be made up with a few being pink, a few blue, and a few yellow. 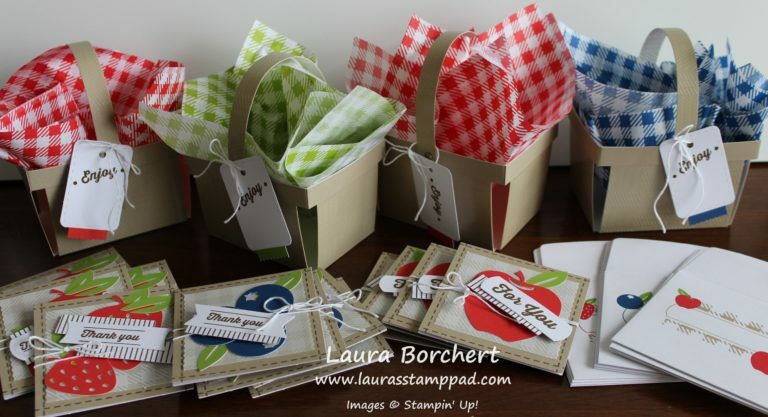 Do you like to make multiples of cards to have on hand or make them as you need them? Let me know in the comments below! Here are the products I used for this card! Today, I’m sharing with your my Mother-In-Law’s amazing card that she created when we stamped together! Isn’t it just precious??? This card is so amazing and Cindy did a wonderful job on it with all the amazing details! Let’s get started on it! Cindy started with a Whisper White card base and layered on a piece of Bermuda Bay (4″ x 5-1/4″). Next, she took a piece of Crumb Cake cardstock to stamp the teddy bear on. She used the Baby Bear Stamp Set. 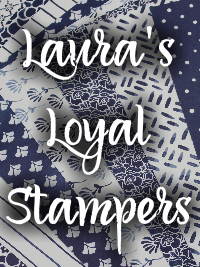 The 3 step stamping was done in Crumb Cake Ink, Soft Suede Ink, and Chocolate Chip Ink. Then she fussy cut out the little bear. This is the crazy part. I am a horrible fussy cutter but she rocked it and it really did make him POP! 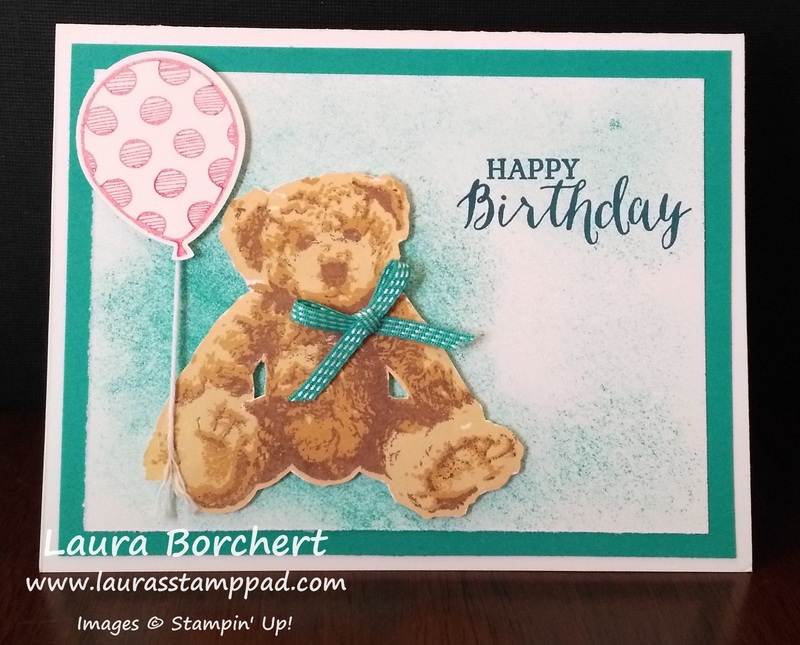 Before adding the teddy to the card front (Whisper White measuring 3-3/4″ x 5″), she added a little color and texture using a Sponge Dauber and Bermuda Bay Ink. Next, Cindy added the teddy to the card from with Stampin’ Dimensionals. The little bow using Bermuda Bay Stitched Ribbon is the perfect accent which was attached with a Mini Glue Dot. 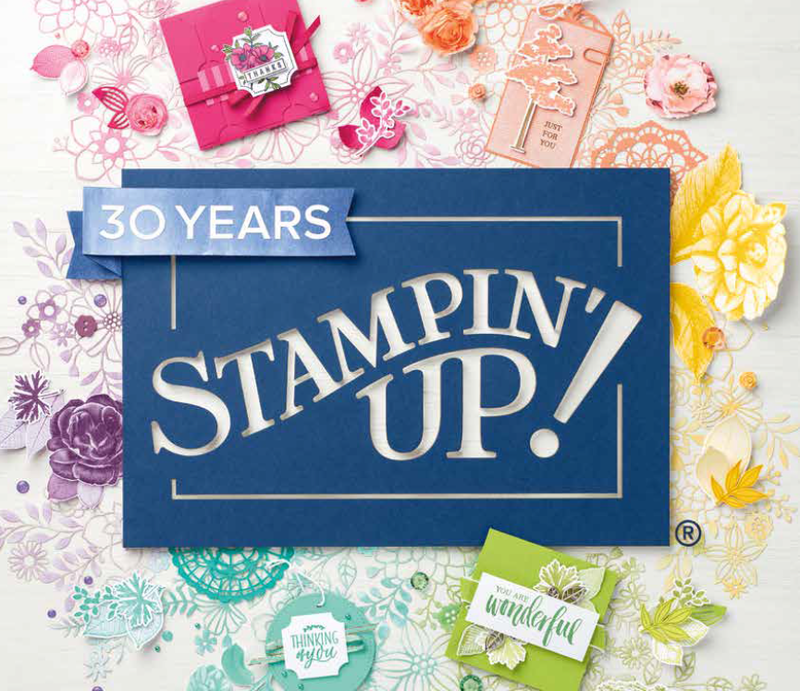 The greeting was stamped from the Rose Wonder Stamp Set in Bermuda Bay Ink! Finally, for the balloon, Cindy used the Balloon Adventures Stamp Set and coordinating Balloon Bouquet Punch. No fussy cutting necessary for that one! 🙂 The balloon was stamped in Rose Red Ink. To adhere it to the card, Cindy added some Whisper White Baker’s Twine to the back of the balloon. She secured it with a Stampin’ Dimensional and then added a smidge of Fine Tip Glue to the teddy bear’s hand to secure the tail because otherwise it would flop around. This card turned out perfectly and Cindy created it especially for her Sister-In-Law! The teddy seems so snugly because of the layered stamping and little bow. I think she will cherish it forever! These items are all while supplies last and some are sold out already! You can start shopping here! Only 1 more month till the New Catalog is out!!! My Mom’s Frog Birthday Card!!! My Mom’s Birthday was earlier this month and this is the card I created for her! She actually fell in love with this stamp set and bought it for me so we could make cards with it. (Note to self: we still need to do that!) 🙂 I started playing with this set and the New Watercolor Pencils and knew this was the perfect set for her card! 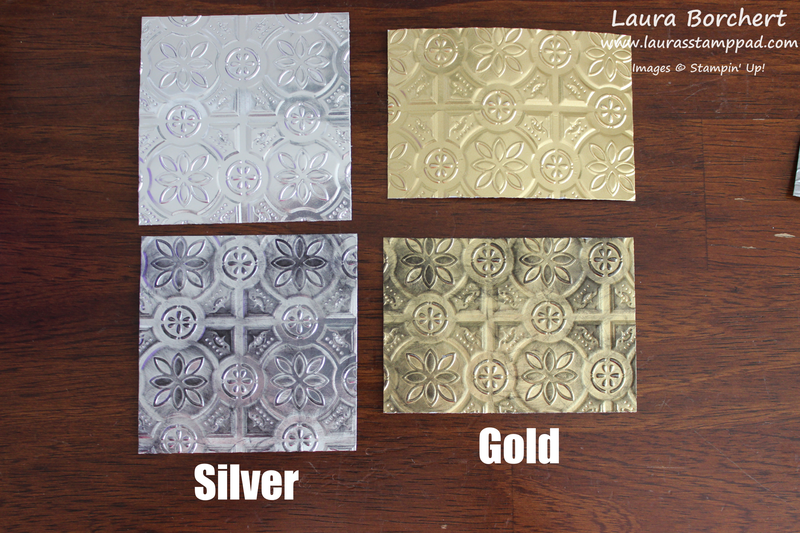 I started with a Crumb Cake card base and then I layered a piece of Old Olive cardstock (4″ x 5-1/4″) on top. I took a piece of Whisper White (3-3/4″ x 5″) and lightly brushed over it with a Sponge Dauber. I did Old Olive Ink on the bottom 1/3 and Pool Party Ink on the upper 2/3. I added a strip of Pool Party Stitched Satin Ribbon across the top and then added it to the card base. For the frog and the wheelbarrow, I stamped them from the You’re Sublime Stamp Set in Basic Gray onto scrap Whisper White. I used the Watercolor Pencils to color in a bit and then I took a Blender Pen and swirled around to move the color and fill in! 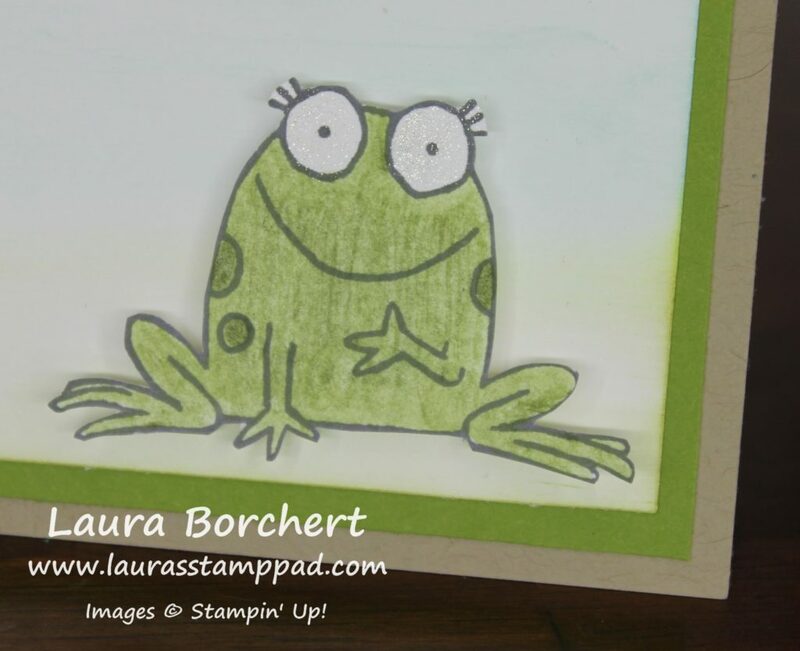 Once it was all colored, I fussy cut out both images and adhered them to the card base with Stampin’ Dimensionals. For the greeting, I stamped it from the Number of Years Stamp Set in Old Olive Ink. I punched out the greeting with the Decorative Label Punch. 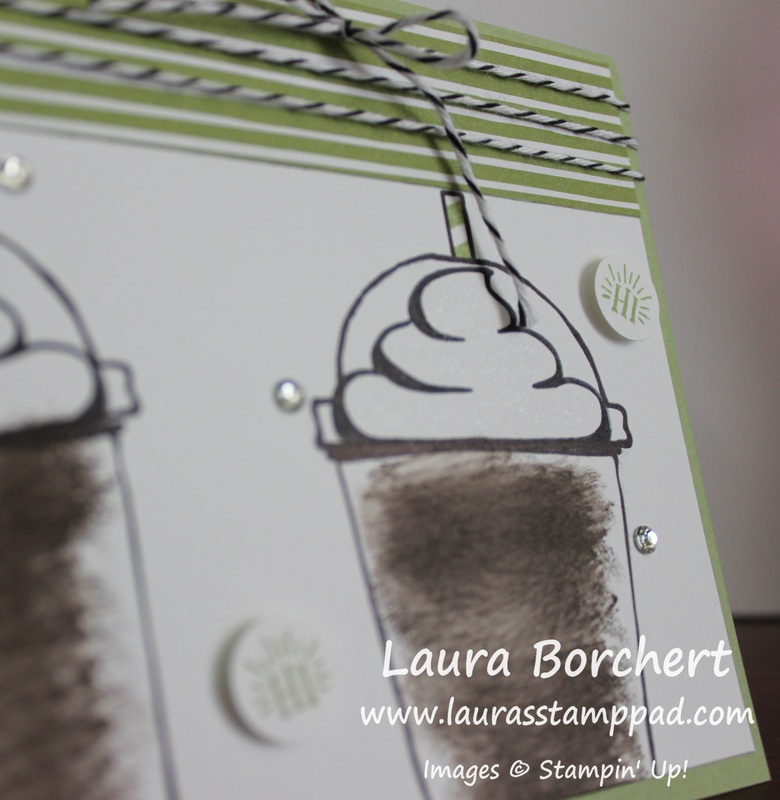 Then I sponged the edges with Pool Party and added it to the card front with Stampin’ Dimensionals too! I love it! I think it turned out perfectly. My Mom loves nature and has a huge garden. This was fabulous! Do you like making cards specifically for a special someone or do you just make general cards for everyone?? Let me know in the comments below! Technique Tuesday – Fall Sunrise!!! Happy Tuesday!!! I hope you are all having a wonderful week so far! Today I’m going to brighten it with a fabulous sunrise! Check out this beautiful card!!! This card gives me all the feels – cool crisp air, dew on the grass, beautiful leaves in every color, cuddling up in a hoodie, and pumpkin pie everything!!! 🙂 Hopefully you too! Let’s get started! I started with a Crumb Cake card base and layered on a piece of Cajun Craze (5-1/2″ x 2″). The Petals & Paisley Designer Series Paper has the perfect fall colors and patterns for any project! I layered a piece of that over the Cajun Craze. 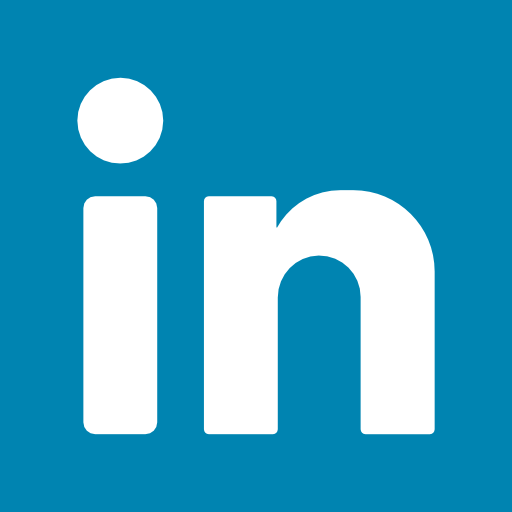 It measures 5-1/4″ x 1-3/4″). I stamped the greeting from the Garden in Bloom Stamp Set in the upper left corner in Chocolate Chip Ink. Now it is time to work on the focal point. I took a piece of Very Vanilla cardstock (2-1/4″ x 3″) and started by stamping the grass along the bottom. 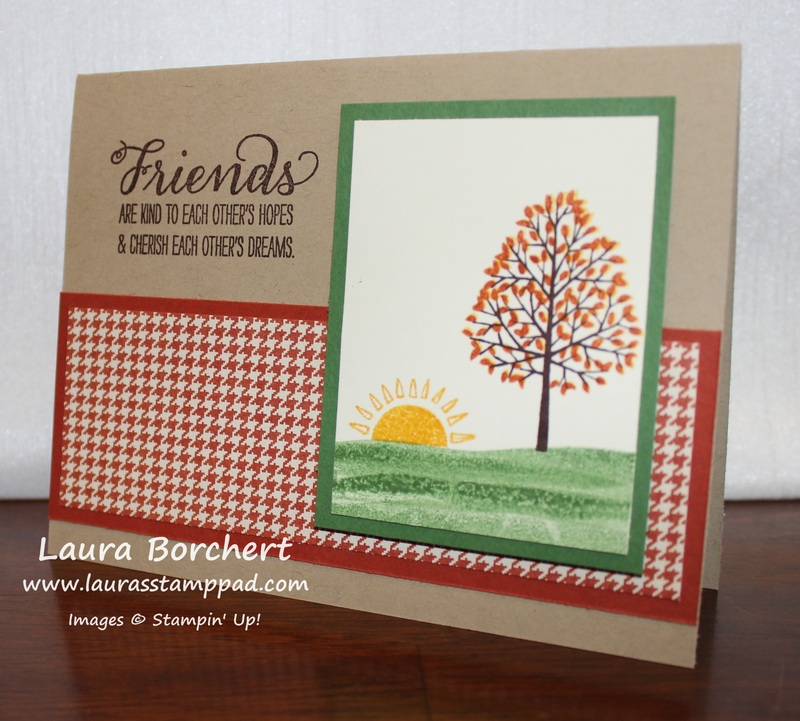 I used the Totally Trees Stamp Set from the Holiday Mini Catalog. The long snake like image was inked in Garden Green, stamped off once and stamped on the bottom of the vanilla cardstock. I did it three times. Then I took the small circle and the sun rays and stamped them in Crushed Curry. Make sure to place a little piece of paper along the green grass to mask the bottom of the circle so it doesn’t stamp onto the grass and instead look like it’s coming up over the horizon. For the tree, I stamped it in Chocolate Chip Ink. Then I took the leaves and stamped them once in Crushed Curry and then again a little off set in Cajun Craze. You could also ink up the leaves in Crushed Curry and then use a Sponge Dauber to add a little Cajun Craze in a few spots. This gives that beautiful array of fall colors to the leaves! 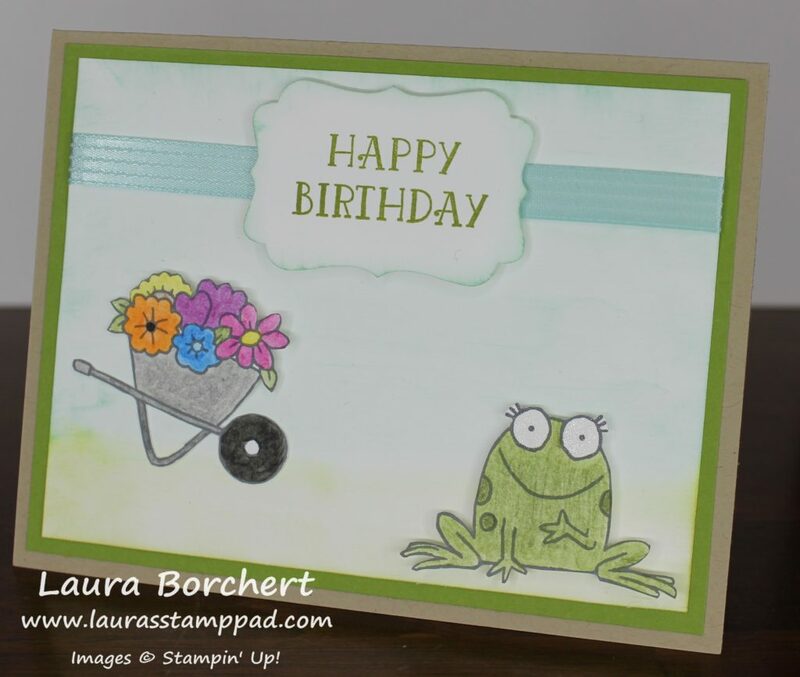 I layered this piece onto Garden Green cardstock (2-1/2″ x 3-1/4″) and added it to the card front with Stampin’ Dimensionals. Isn’t it stunning for all of your fall occasions!?!?! If you would like to see this all in action, check out the Video Tutorial below or click here! 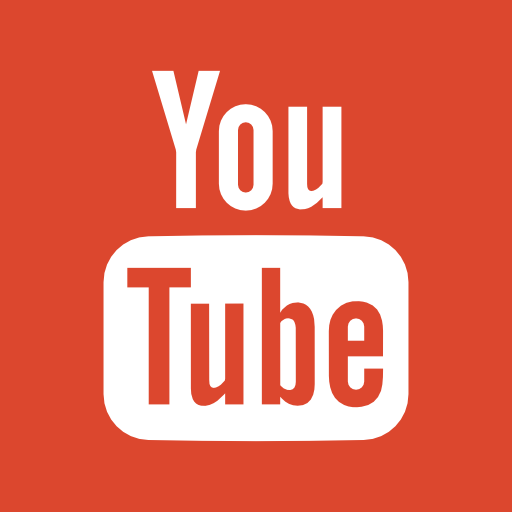 Be sure to give it a thumbs up if you liked it and don’t forget to subscribe if you are new! The Totally Trees Stamp Set is lots of fun for all seasons and occasions but also you can use the images to create fun backgrounds!